The Bat was a steel suspended roller coaster that operated from April 1981 to 1983 at Kings Island in Mason (Cincinnati), Ohio. It was a prototype ride designed by Arrow Development just prior to being bought by Klaus Huss in November of 1981. Construction of The Bat began in early 1980. By October of that year, the station and lift hill had been completed. That same month, the park placed a train on the completed station track and announced the ride at a large press event. Although billed by the park as "the first suspended coaster," other suspended coasters dating back to the turn of the century had existed. The Bat was a state-of-the-art coaster that was only open sporadically. After SBNO (Standing But Not Operating) for an extensive period of time, park officials announced on November 9, 1984 that the ride would be dismantled. Over the next two years the ride was removed. Nearly simultaneously, Arrow-Huss filed for bankruptcy in late November 1984. Early on in its life the Bat began to have multiple problems. The shock absorbers located on the train's connecting struts began to wear out and break long before their expected life. Maintenance crews had to replace many of the shocks on a daily basis. Another problem was the discovery of alignment problems in the coaster's track and joints. Stress tests revealed numerous cracks in both the track and struts. Arrow-Huss began repairs, but suspected the track's design as a possible cause of the structural problems. After further inspection, Arrow-Huss determined that the forces from the lateral damping loads were transferring into the swinging cars. The excess forces on the struts contributed to the shock absorbers wearing out early. Additional stress to the struts also occurred due to the brakes being located on the bottom of the cars. 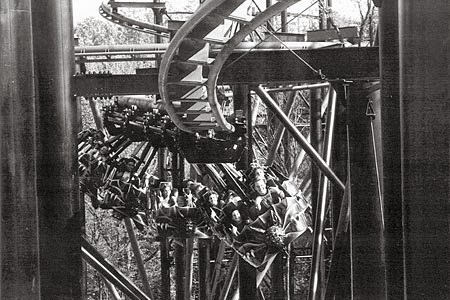 Kings Island and Arrow-Huss worked constantly, trying to fix it, but after four seasons of mostly being closed, the Bat was dismantled after the 1984 season. This brought rise to a new roller coaster designed by Arrow Dynamics called Vortex, which was a record breaking roller coaster for its time.